One of our favorite restaurants when we lived in NYC was Brooklyn’s No 7.. We were very delighted when they opened their sandwich restaurant called “No 7. 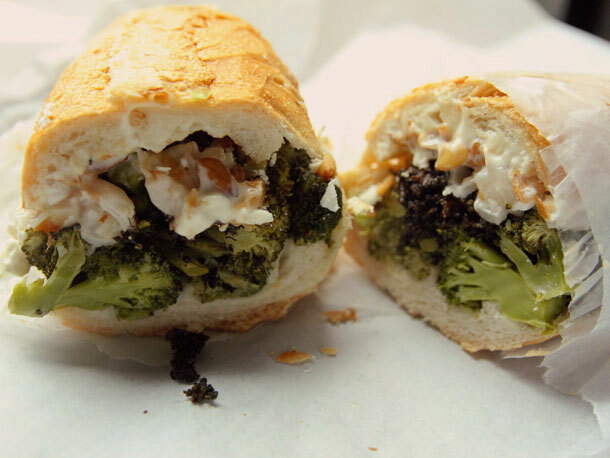 Sub” in Manhattan not too far away from our office, and it too, quickly became a favorite. We were very excited to hear that Tyler Kord released a cookbook, A Super Upsetting Cookbook About Sandwiches, and it reminded us of one our favorites, the broccoli sandwich. You can get more of the details on that sandwich here, or you can buy the cookbook, or you can now live your life enlightened with this new information: that broccoli can make an excellent main ingredient for a sandwich. Try it. Be forever changed. Thank Chef Kord, buy his book, and spread the gospel.